It is a sad fact that I have had only three pairs of running shoes in the last 16 years. I’m pretty sure that you are supposed to change shoes more often than that. I guess it is an indication of my lack of activity in the exercise department, I don’t think I ever really wore them out. When I was 27 I retired my teenage years’ Reebok X-trainers and bought some Asics in London (which I used for running around Hyde park at ungodly hours in the depths of winter). Those poor old runners have been doing it hard in all kinds of unforgiving terrain until last week! That is approximately 5 years of wear. I think I have actually worn this pair out. Fabric is pulling away from the rubber, I can feel stones through the soles as I run, I always end up with wet feet and they just don’t seem to be holding their shape as well anymore. Definitely time to get new shoes. My first impulse was just to go get the exact same shoes again, but as I was talking to people I became aware that regular shoes maybe weren’t suited to the rough, country conditions I was now running on. I got me some Salomon trail running shoes. These things are tough! They are very firm, made out of space age materials and have nifty quick lace up thingies. I heart them immensely. While on a bit of a gearing-up rampage, I also came to the conclusion that I spent a lot of time adjusting my clothing while running. Pants slipping down, tops creeping up. Getting too hot, getting too cold. It was distracting! So, I braved the fitness clothing stores and came away with something that I had always feared–>running tights! My first instincts when looking at these tiny things on the shelf was that they wouldn’t have a size big enough for me. Wrong. The shop assistant came along, eyed me over and picked up —wait for it—- not the biggest size in the store!!!! When I tried them on i was afraid to look in the mirror at what was sure to be a wobbly, muffin-toppy, jumble of white skin and black encased cellulite. WRONG. I looked good! These crazy things actually made me look good! Unbelievable. On a high from the running tights situation, I decided to try out one of those fancy space age tops that defies all logic and manages to keep you dry/warm/cool all at the same time. It also looked pretty good. So I’d done it. I’d braved a Lorna Jane shop and come out not feeling demoralised by shop assistants that looked like Michelle Bridges, but excited to get home and put my new gear on. The results? Oh my gooooooooodness!!! Why have I been struggling with the other stuff all this time? I have been running three times in my new stuff and felt like some kind of athletics queen. I didn’t “jiggle” when I ran (thank-you, running tights with your just right amount of compression), I didn’t over heat despite my top having long sleeves, I wasn’t too cold despite it being about 0 degC when I went out one night (with me headlamp on). It was a miracle. I jogged better. I felt like I looked good while out there. I had a confident step and lightness in my heart. Yeah. Need some motivation to get exercising? Go out and get yourself some REAL sports wear. It is worth it. I’ve been at work full-time for 3 weeks and when I get home from work I don’t have the luxury of time when it comes to cooking! I like the kids to eat at 6pm, bath at 6.30 and in bed by 7. I run a tight ship! As a result, we have been eating a lot of fast food. No, don’t worry, I’m not talking about Macca’s or anything like that. I mean food that is really fast to make. To make this recipe gluten-free, replace the soy sauce with Tamari. I still find it hard to believe that soy sauce is a naughty old gluten harbourer!! I am still trying to stick to 300 cal per meal (Michelle Bridges 12 Week Body Transformation style) with a good amount of protein. Hence heaps of mushies. I have those little single serve miso paste packets in my fridge at all times. I find them useful to add to dishes instead of fish sauce as a salt element. I do cheat a bit, I have been buying those puree herbs that you see in the fruit and vege section of the supermarket. They are really tasty! You can just as easily chop up fresh herbs. Interestingly, sesame seeds are high in calcium so I get my daughter (who can’t have soy or dairy) to sprinkle them on everything. This recipe will serve two. Put the tofu in a small bowl, or shallow dish. Combine the grated ginger, apple cider vinegar, soy sauce, brown sugar and water then pour over the tofu. Cook the zucchini in the wok for about 5 minutes, tossing intermittently. Then add the mushroom and cook for a few more minutes. Combine the miso paste, lime juice & zest and herb puree. Maybe add a tbsp of water if your lime wasn’t very big. Add miso mixture to wok and cook for a few minutes. 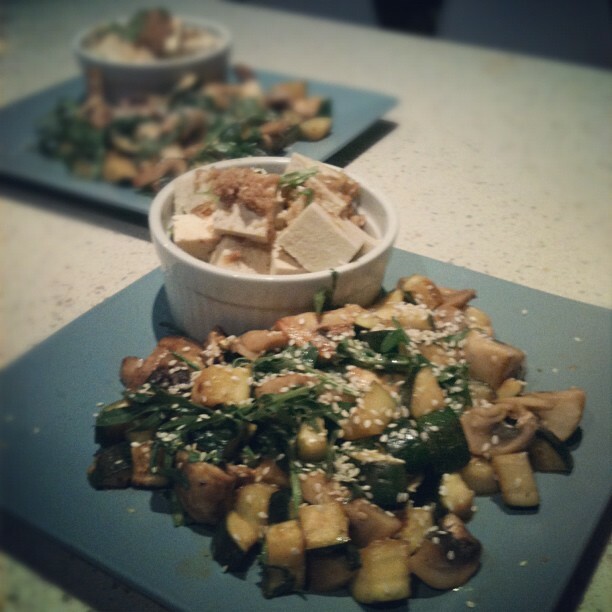 Toss through rocket just before you serve on a platter with tofu bowl and sprinkle with sesame seeds.